The Spirit of Billy The Pig: Save The Planet. Vote For Billy. An irregular blog from a late guinea pig. Save The Planet. 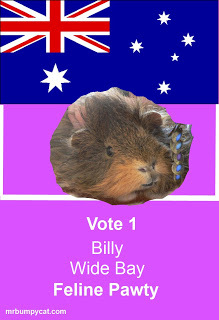 Vote For Billy. The cats of Australia in their wisdom have made me an honourary feline so that I can represent the newly formed Feline Party in the seat of Wide Bay in this September's general election. The Cat Party should not be confused with the Katter Party. The Cat Party is an organisation run for the benefit of small furry things who poo in a litter tray, catch lizards and are quite capable of licking their own testostricles. While the Katter Party is run for the benefit of strange, backwards looking humans with a penchant for large hats who are not capable of licking their own testostricles but think it might be fun to try. The best thing about the Feline Party is that you don't have to toe the party line if you don't agree with what they stand for on any given issue. This is different from most political parties and is the main reason my my staff have never joined one. In most cases, once you sign up to a political party you are bound to support it's policies, even if they appear ludicrous. In fact even if they are detrimental to the people you were elected to represent. In fact even if you deem it to be against the national interest. Guinea pigs like yours truly find it outrageous that the two main parties in Australia often seem to put the interests of their part before the well-being of the nation. Anyway, I'm going to take advantage of the platform of my weekly blog post to outline my vision for the future of the nation and to announce the policies that will make Australia a proud and powerful nation in ten years time, not one that is just a bloody great big disused open cut mine filled with toxic sludge. 1. The Feline Party will recognise climate change as a scientific reality . This is the most important issue facing us all. Political parties who continue to believe that it is a lefty pinko plot to deprive their head office of air conditioning will be branded as terrorist organisations because ultimately they are a threat to world stability and as such they will not be eligible to contest elections. So that's pretty much every conservative leaning party in the world out of the way for a start. Actually, come to think of it, that's about it really. We only need one policy as long as it's a good one. Everything else is just tinkering at the edges. Let's examine what would happen if we addressed climate change. Certain sectors would lose jobs in the short term. There'd be fewer jobs in mining, especially coal, but this would be offset by new jobs coming online in renewable energy such as solar, wind, even tidal, and ultimately more jobs would be saved than lost if we all keep going the way we are at the moment. Severe weather events made more common by climate change destroy jobs. They wreck infrastructure, close businesses for days, prevent people from travelling to work and destroy farming jobs and ultimately the little towns that act as service centres for those farms. The odd thing is that the folk that live in these little farming communities are often the ones most likely to pooh-pooh the idea of climate change and yet they have the most to lose from it. Still they choose to believe the mad ravings of Lord Monckton rather than thousands of real scientists worldwide. Our own home grown buffoon Tony Abbott - scarily perhaps Australia's next Prime Minister says that climate change is "a load of crap". 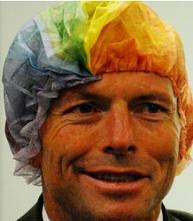 Tony Abbott "A load of crap." So, what will happen to these farming communities as the planet warms. The surrounding farmland will become more and more marginal. Droughts will last longer, floods will be more severe, bush fires will be more common. Gradually the viability of the farms decreases to such an extent that many farmers are forced to walk off their land. It's already happening. Farmers and their families no longer have the money to spend in these little towns and so slowly these little communities die a death by a thousand cuts. Young people leave because there are no longer jobs for them. Hospitals close, schools close and people leave for the cities in search of a wage.. In some cases mining takes up the slack, but this is not sustainable. Mines don't last forever and sooner or later they too are destined to close. In other words, contrary to what many political parties believe, it is more expensive to bury your head in the sand and do nothing about climate change than it is to address the problem. Doing nothing is not only foolhardy financially either. It will lead to conflict between nations as they compete for water and food and we all know how expensive wars are. Let's face it, the only people who benefit from them are the arms manufacturers of China, Russia and the United States. So, what do we need to do? Well for a start vote for me or your local Feline Party candidate in September. Even if you don't live in Australia, vote for me anyway, and don't limit yourself to just one vote. I for one will be voting for myself several hundred times, as will my staff and Badger. Lets get things moving now to save the planet. If we leave it to humans and their complacent political parties nothing will happen because they are all beholden to the donations that they receive from big business and are too short sighted to risk the flow of funds from their donors by putting in place climate change mitigating legislation that might decrease their donors' profits - even in the national interest. Even in the interest of the planet. The Feline party is the only party to put the long term interests of the Nation first and foremost. A vote for any other party is a vote to continue the status quo. (Not that there's anything wrong with that. They are a fine band. Even better, now that they have their old age pension.) A vote for either the Australian Labor Party or the Liberal National Party is just a vote for the short term interests of the Party. Now, in the wildly optimistic words of former British Liberal Party leader David Steel "Go back to your electorates and prepare for government"
I'll be voting for whoever promises free and unlimited foot care. I think that's important. Don't you? Click the ad to help guinea pigs.